pertaining to a discolored area on the skin or membrane caused by blood seeping into the tissue as a result of a contusion. Compare bruise. These lesions tend to be nonpalpable, ecchymotic, and non-blanching, with a linear or geometric morphology. like ecchymotic spots, and the house smelled like a hospital" (qtd. Warfarin necrosis Necrosis of skin and soft tissue; painful, ecchymotic lesions leading to hemmorrhagic blisters that rupture and form new lesions. Wounds at risk consist of avulsed skin flaps, wounds located over the pretibial surface and Achilles tendon; and flaps that are contused, ecchymotic, or blanched. 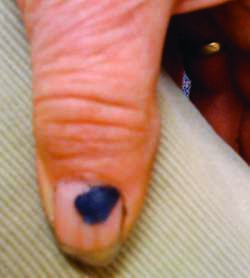 After 30 days, ecchymotic residua were still visible, but local tenderness was diminished. Preoperatively, investigate the presence of petechiae, ecchymotic lesions, telangiectasias, hepatosplenomegaly and haemarthrosis of the joints. Some urticaria, especially in younger children as in this case, is sometimes called "urticaria multiforme" because the ecchymotic centers are reminiscent of, but distinct from, classic target lesions of EM. Initially the lesions are single and less than 1 cm, but later coalesce to form ecchymotic areas. 150ppm###Decrease feed intake low Ecchymotic hemorrhages in heart congestion###Vodela et al. Gardner Diamond syndrome (GDS) which is also known as autoerythrocyte sensitization syndrome, psychogenic purpura, painful bruising syndrome is a rare autoimmune vasculopathy which mostly recurs after emotional stress and which is characterized with painful ecchymotic lesions. Within hours, the ecchymotic lesion on her right thigh rapidly grew in size, with increased erythema and necrotic changes in the surrounding tissue (Figure 1, A and B). Integumentary system lesions are mainly cyanosis, edema, and ecchymotic hemorrhages while there were inflammatory, degenerative, and necrotic lesions in the musculoskeletal system.